These are the confessions of a terrible mother: My sweet girl Jessie ran eagerly out of school on Monday only to trip and fall cutting her hand. I offered her cuddles and kisses but the only thing that was going to comfort her was a plaster (Band-aid for you Americans) to stop the gush (ok, slight exageration) of blood. It was as if she knew that this was the one thing I couldn't provide, and so sheepishly I made my way over to a much better mother than me and begged and borrowed a plaster from her. Drama over! In the mean time I decided not to get caught out again and make a little pouch to keep in my handbag with plasters, Calpol and anything else a small child might suddenly need. Here is how I did it. Here you can see I have cut out a rectangle of fabric 20cm-25cms and a 18cm-23cm piece of felt. Felt is an easy fabric to use as backing as it makes the fabric feel more luxurious and it doesn't fray. I cut out a small emergency cross from white and red felt that I tacked onto the fabric layer 4cm from the top with white embroidery thread. You could use any design on the front of your bag - glasses for a glasses case, coins for a purse etc. I have never sewed a zip before and was interested to see how it would go. I tucked under the top 1cm of the bag and pinned it to the top of the felt and to one side of the zip (see picture), and then used my sewing machine to sew the whole length - you could easily hand sew this instead. Then fold the felt up to the zip and then the fabric. 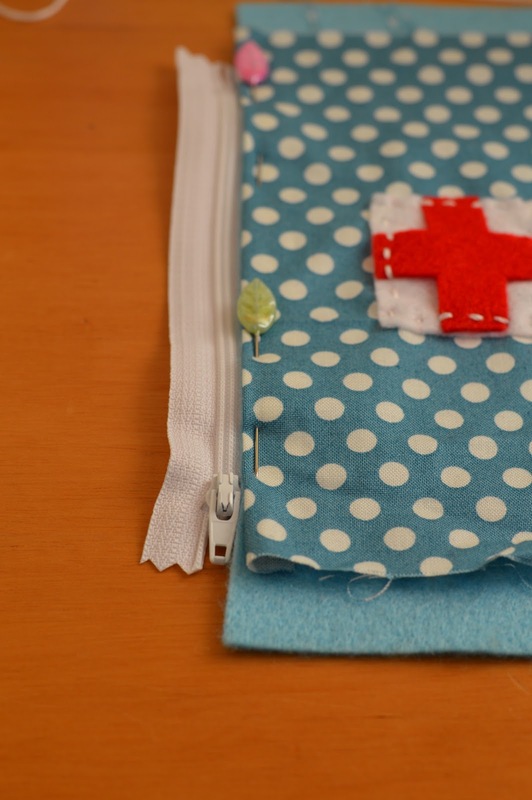 You will need to fold under the spare 1cm of fabric under the felt and pin it to the other side of the open zip. 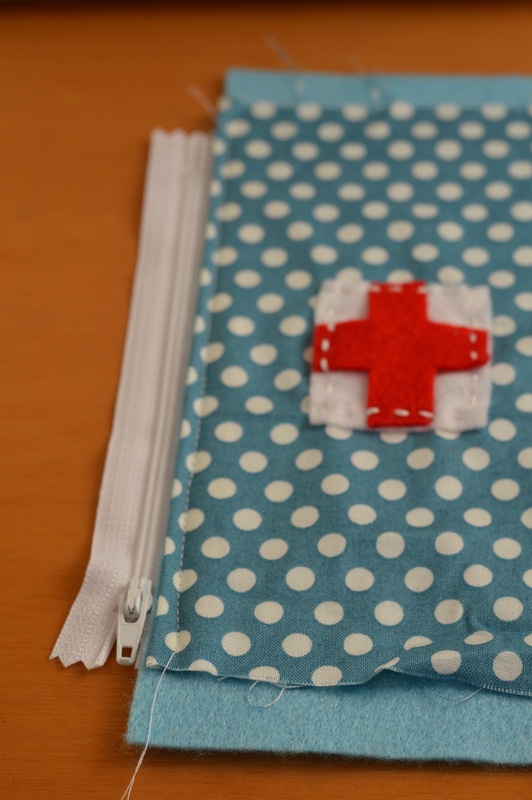 Then with a little bit of sewing machine gymnastics (or you can hand sew) join the three layers up. This was the trickiest part, and I now understand why zips are longer then they need to be as it allows the sewer to flexibly move the machine around the zip. Finally sew down the sides and cut of the extra felt. You can do this as I did by folding the fabric under itself and sewing down the sides, or you could flip the whole lot inside out, sew it either side and then turn it out. Either way, I am sure you will have lots of fun, and the possibilities are endless for creating lovely little bags for you or presents for your friends.